ROANOKE, Va. -- Hundreds of mourners crowded into a church Tuesday to honor Adam Ward, the 27-year-old television cameraman who was slain while filming a live interview. The Rev. Rob Lough told more than 500 people in the First Baptist Church of Roanoke about Ward's compassion and laughter, his passion and wit. He loved people, Lough said, "and the people loved Adam." His siblings also spoke, with older brother Jay Ward saying "we always looked up to him." Sarah Crowder said that while her brother's death has been devastating for his family, memories of him have stirred more laughs than tears. Ward and WDBJ-TV morning reporter Alison Parker were fatally shot by a former co-worker on live television during an interview Wednesday. The woman she was interviewing, Vicki Gardner, was wounded and is now recovering. On Monday, a visitation resembled a celebration at Salem High School, where Ward graduated in 2007. Ward's parents exchanged greetings, hugs and even a few smiles with many of the well over 1,000 mourners, while upbeat music piped softly into the school auditorium. Visitors obliged with a request by the family to wear colors of Ward's favorite teams, Virginia Tech and Salem High. He played football for the high school's Spartans on state championship teams in 2004 and 2005. Members of the current team attended Monday's reception in their uniforms. Photos of Ward dotted the halls of the high school as mourners went through the long line. 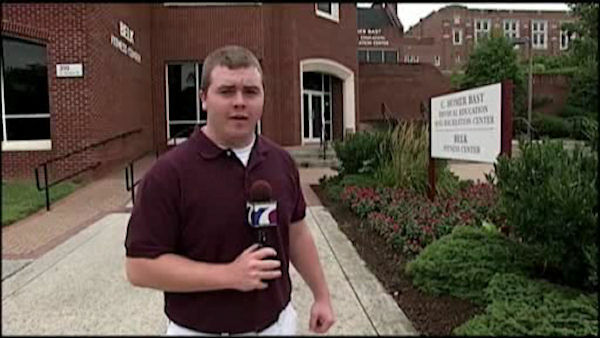 Ward's casket was all things Virginia Tech, where he graduated in 2011 with a degree in communications. Salem High Principal Scott Habeeb said Monday that Ward "loved life and he was truly kind to people." Habeeb was the offensive line coach when Ward played middle school football, was one of his teachers as a high school freshman and was an assistant principal for Ward's final three years of high school. Habeeb said Ward wore shorts to school every day "no matter how cold it was. His dad told him he was a 'knucklehead,' but he did it anyway. He was fun. But he was genuine." Ward's father, Charles "Buddy" Ward, is a retired guidance counselor at the school, which Adam chose to attend even though he lived in another district. Ward was engaged to morning show producer Melissa Ott, who had recently gotten a job in Charlotte, North Carolina. She was celebrating her last day working in Roanoke when the shooting happened. Ward and Ott, who also attended Monday's reception, were planning to get married in July 2016. "This is not just the loss of a student," Habeeb said. "This is a loss of a family member because he's a Spartan. He's part of us. His father's part of us."